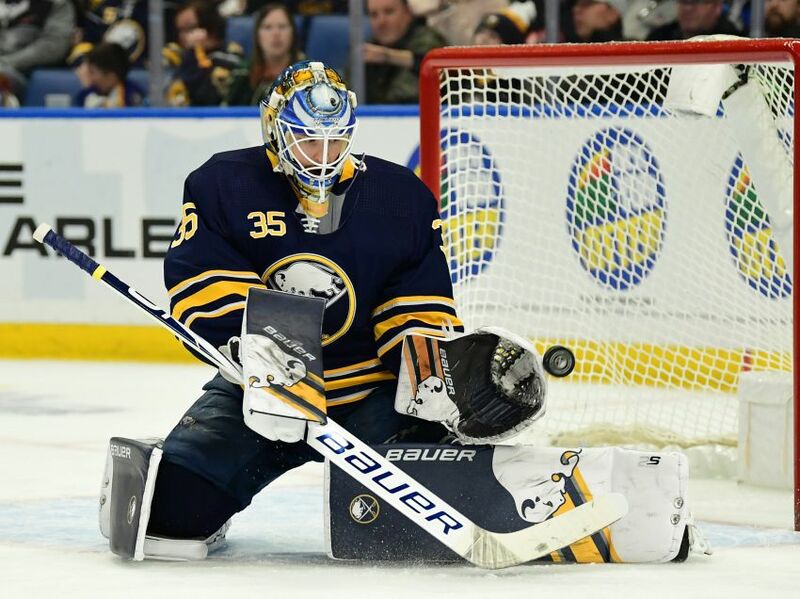 BUFFALO – Amid all the chaos that materialized around him, Sabres goalie Linus Ullmark calmly moved around his crease, making save after save in Tuesday’s thrilling 5-4 shootout victory. Right now, having allowed 39 goals over the last nine contests, the Sabres are a mess defensively. So Ullmark can be forgiven for allowing four goals. Ullmark still stopped 41 shots and all three shootout attempts against the Minnesota Wild, securing just the Sabres’ third win in nine tries. From the get-go Tuesday, Ullmark, as he has so often this season, looked like a difference-maker, regularly bailing out his teammates and instilling confidence. Ullmark, 25, has been wrestling starts away from the struggling Carter Hutton. Expect the Swede to keep earning more action down the stretch. “He was really good,” said Sabres center Evan Rodrigues, whose power-play goal opened the scoring 4:31 into the tilt. “He’s got such a calming effect back there. He’s always in position, he doesn’t reach for pucks. The Sabres would’ve endured a heartbreaking loss before the crowd of 16,847 inside KeyBank Center if Ullmark wasn’t at the top of the game. They blew three leads, including a two-goal advantage in the second period. Zach Parise scored the tying goal with an extra attacker on with 1:37 left in regulation before winger Sam Reinhart’s shootout goal won it. The more the Sabres talk about cleaning up defensively, the worse they seem to get. After Reinhart scored in third round of the shootout, Ullmark stopped Parise but appeared to get hit in the head on the play. Ullmark said he had no clue what happened. “I feel fantastic, a win, 5-4, absolutely awesome,” Ullmark said. The win was critical for the Sabres, who played the second contest of a seven-game home stand. If they enjoy a success stint here, they’ll like stay in the playoff race or jump back into a spot. If they falter, they could fall out. They’re three points out of the Eastern Conference’s final spot. The Sabres took advantage of the Wild early, going up 3-1 after winger C.J. Smith and defenseman Rasmus Dahlin (power play) scored in the second period. Housley’s new lines, defense pairs and power play units seemed to be paying dividends. But the Wild tied it before the second period ended thanks to Jared Spurgeon’s second score and Charlie Coyle’s goal. Reinhart put the Sabres up again in the third period. By the third period, Housley scrapped some of his new line combinations. Most notably, he put his two NHL All-Stars, 31-goal winger Jeff Skinner and slick center Jack Eichel, back together. Ullmarks a good stopgap until Ukko-Pekka Luukkonen or Jonas Johannsson is ready. I’m not convinced Ullmark has what it takes to win a Stanley Cup. Just because Swedish goalie coaches say he is a calm goalie doesn’t necessarily translate into a championship goalie.